DARMSTADT, Germany — Comet scientists planned to send up new orders to Europe’s Philae lander Thursday to kick off a second day of research after the probe endured a jumpy touchdown on comet 67P/Churyumov-Gerasimenko. Time is of the essence because the oven-sized landing craft is facing a power crunch. The lander bounced across the comet’s tortured landscape before coming to rest near a cliff that blocks sunlight from reaching Philae’s solar panels, meaning the craft’s power generation system may be unable to recharge its batteries. Officials said Thursday the Philae might be on its side, with two of its landing legs contacting the comet’s surface and another off the ground. The first images from Philae’s CIVA camera system — made up of seven micro-cameras in a ring around the lander — appeared to show fragments of rock illuminated by the sun on one side of the probe and the sky on the other side. 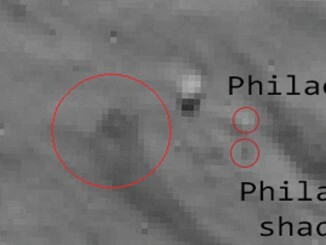 Philae’s landing legs also appear in the images. 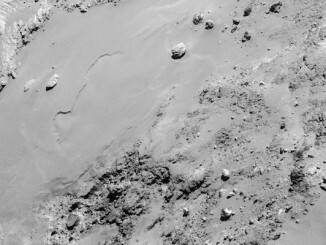 Rosetta’s lander Philae has returned the first panoramic image from the surface of a comet. The view, unprocessed, as it has been captured by the CIVA-P imaging system, shows a 360º view around the point of final touchdown. The three feet of Philae’s landing gear can be seen in some of the frames. 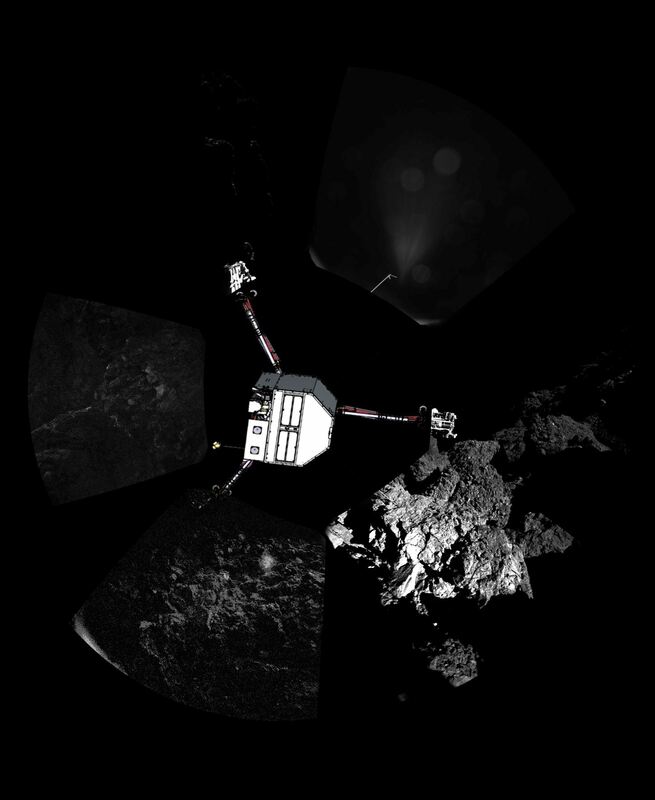 Superimposed on top of the image is a sketch of the Philae lander in its current configuration. Credit: ESA/Rosetta/Philae/CIVA. Bibring said many scientists expected the comet’s surface to be powdery, allowing the lander to settle instead of rebounding back into space. 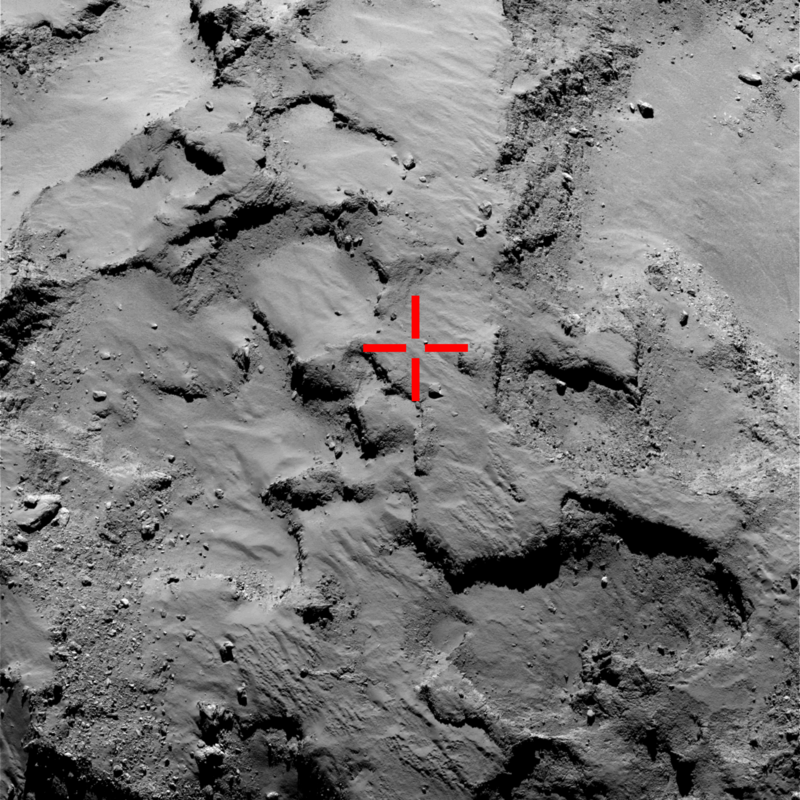 Officials have not pinpointed the lander’s location on the comet. Stephan Ulamec, leader of the Philae team at DLR — the German Aerospace Center — said the landing craft could have bounced up to a kilometer (0.6 miles) off the comet before coming back down a kilometer away from the mission’s intended touchdown site. “We have a better understanding now of how we got there, but we still do not really know where (the lander is located),” Ulamec said. According to Ulamec, the next opportunity to contact Philae will be after 1900 GMT (2 p.m. EST) Thursday. 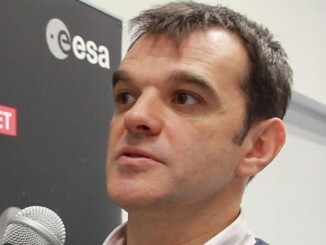 Ground teams based at the European Space Operations Center here, the lander control center in Cologne, Germany and the Philae science team headquarters in Toulouse, France, will uplink commands to the probe Thursday night through the Rosetta orbiter, which released Philae for its seven-hour descent Wednesday. This image from Rosetta’s camera, taken in September, shows the place Philae first landed before bouncing twice and finally coming to rest about a kilometer away. Credit: ESA/Rosetta/MPS for OSIRIS Team MPS/UPD/LAM/IAA/SSO/INTA/UPM/DASP/IDA. Ulamec and Bibring said the command upload Thursday night will likely include orders to deploy a boom designed to measure the temperature of the comet’s surface and an X-ray spectroscopy instrument to study the chemical composition of material around Philae’s landing site. Controllers will also tell Philae to take pictures for another panorama after adjusting the camera’s exposure settings in hopes of improving on the imagery released Thursday. “We need to be very careful about activating mechanisms,” Ulamec said. The extension of Philae’s temperature boom could nudge the lander out of its current position. The comet’s feeble gravity field — one hundred thousand times less than Earth — means the lander, which weighed about 220 pounds on Earth, weighs as much as a paperclip after landing. Officials want to see how the deployment of instrument arms Thursday night changes the lander’s orientation. “We will be able to see whether this has modified our position,” Bibring said. Plans to use Philae’s drill, which is supposed to bore nearly a foot into the comet nucleus, pose more problems. The drill is designed to extract a core sample and deliver the soil to a miniaturized laboratory on the lander for analysis. Scientists are trying to find out if the comet contains ice made of water similar to that on Earth, and they are looking for signs of organic molecules like amino acids, the building blocks of life. Comets may have seeded Earth with water and organics, allowing life to spring up billions of years ago. 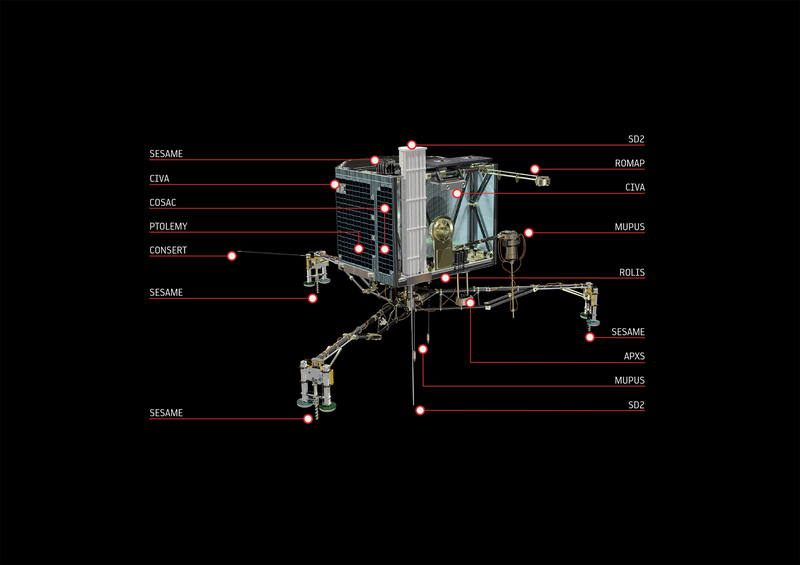 Bibring said such measurements are “fundamental” to the Philae mission, but some of the lander’s sensors could gather data in “sniffing mode” not requiring direct contact with the material. “Of course, we want to drill, but we have to secure the drill,” Bibring said. Ulamec dismissed discussion — at least for now — of trying to fire the lander’s harpoons, which failed to engage during Philae’s descent Wednesday to anchor the spacecraft to the comet. Momentum from firing the harpoons — assuming they still work — could propel the lander out of its current location into a more favorable place for exposure to sunlight, which could generate power to keep Philae from freezing. 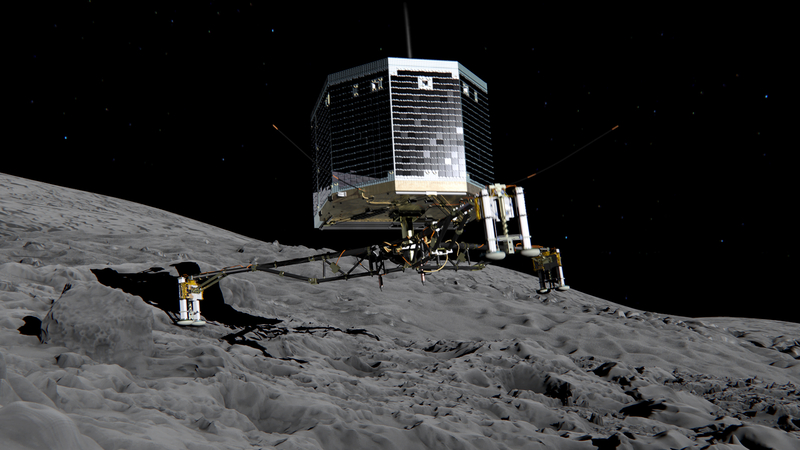 Philae’s power crisis could drain the lander’s primary and secondary batteries by this weekend. In a press briefing from Philae’s science operations center in Toulouse earlier Thursday, officials estimated the lander had between 50 and 55 hours of power left in its batteries. The lander was designed to operate for more than two days on battery power, then recharge its batteries with solar energy for an extended mission that could last until March, when the probe is expected to overheat as the comet nears the sun. Bibring said Philae carries 40 kilograms (88 pounds) of equipment that must be heated to at least minus 50 degrees Celsius (minus 58 degrees Fahrenheit) to keep it from freezing. If the hardware gets too cold, the lander will not be able to wake back up again. In the long-term mission, Philae was expected to wake up for intermittent research observations and hibernate to recharge its batteries. “We are calculating now what this means for the near future … but unfortunately this is not the situation that we were hoping for,” Geurts said. With the future of Philae uncertain beyond the weekend, scientists are focused on the short-term. “We want to pack in as much as we can now,” Bibring said.